The Motorola RAZR MAXX is a almost identical to the RAZR Android smartphone, but with a much bigger battery. 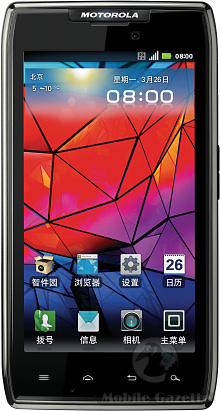 The RAZR MAXX is based on the DROID RAZR MAXX, available on Verizon Wireless in the US, however this particular RAZR is heading for China with no word of a European version at present. Although many people will recognise that the RAZR name has been used before, there was also another RAZR MAXX too back in 2006. More confusingly, the RAZR MAXX shares the "XT910" designation with the standard RAZR smartphone that is sold worldwide. The key selling proposition here is the battery. Motorola haven't confirmed the size of the cell, but with the US version it is a huge 3300 mAh unit, with nearly twice the capacity of the standard RAZR. The battery adds a couple of millimetres to the handset's thickness and about 20 grams in weight, but it's a good trade-off in our view as you can never have enough battery capacity with an Android phone. Just in case you're not familiar with the specification of the RAZR, this is a powerful device with a dual-core 1.2GHz CPU, it has a 4.3” 540 x 960 pixel display covered with Gorilla Glass, an 8 megapixel primary camera plus a 1.3 megapixel video calling camera, it has a water resistant coating and it retains the RAZR's signature Kevlar back. This is an Android 2.3 device, presumably with an upgrade to Android 4.0 in the works. Because this is an Android phone then it does everything that every other Android phone can do, plus it comes with a few software extras thrown in by Motorola. Motorola have omitted a few key points from their press release - we don't know what carriers the RAZR MAXX will be available on, we don't know what bands or even cellular standards it uses and we don't know how much it will cost. Still, these facts are probably not all that important if you don't live in China. We very much hope that there will be a version of the RAZR MAXX in Europe and elsewhere. It might just be the perfect cure for smartphone battery anxiety syndrome..